Superb Lyrebird or Weringerong (Menura novaehollandiae) is found in areas of wet forest in Victoria and New South Wales, and in Tasmania where it was introduced in the 19th Century. Females are 74-84cm long, and the males are a larger 80-98cm long — making them the third-largest passerine bird after the Thick-billed Raven and the Common Raven. Many Superb Lyrebirds live in the Dandenong Ranges National Park and Kinglake National Park around Melbourne, the Royal National Park and Illawarra region south of Sydney and in many other parks along the east coast of Australia as well as non protected bushland. Albert's Lyrebird (Menura alberti) is slightly smaller at a maximum of 90 cm (male) and 84 cm (female) (around 30-35 inches) and is only found in a very small area of Southern Queensland rainforest. This a pheasant-sized songbird has a brown upper body plumage and rich chestnut below. It is very similar with the Superb Lyrebird in its habits. This bird also mimics other species sounds. The rarer of the two species of lyrebirds, the Albert's Lyrebird lacks the elegant lyre-shaped tail feathers of the Superb Lyrebird. It also build platforms by trampling down dense vegetation for courtship display instead of scratch up mounds. The diet consists mainly of small animals found on forest floor or from rotting logs. Named after Prince Albert, the Prince Consort of Queen Victoria of the United Kingdom, Albert's Lyrebird is inhabiting and endemic to subtropical rainforests of Australia, in a small area on the state border between New South Wales and Queensland. Due to ongoing habitat loss on this restricted range species gives the Albert's Lyrebird its Vulnerable status on the IUCN Red List of Threatened Species. Lyrebirds are among Australia's best-known native birds, even though they are rarely seen in their natural habitat. As well as their extraordinary mimicking ability, lyrebirds are notable because of the striking beauty of the male bird's huge tail when it is fanned out in display; and also because of their courtship display. Male lyrebirds call mostly during winter, when they construct and maintain an open arena-mound in dense bush, on which they sing and dance in courtship, to display to potential mates, of which the male lyrebird has several. Females build an untidy nest usually low to the ground in a moist gully where she lays a single egg, and she is the sole parent who incubates the egg over 50 days until it hatches, and she is also the sole carer of the lyrebird chick. The classification of lyrebirds has been much debated. They were briefly thought to be Galliformes like the broadly similar looking partridge, junglefowl, and pheasants that Europeans were familiar with, but since then have usually been classified in a family of their own, Menuridae, which contains a single genus, Menura. It is generally accepted that the lyrebird family is most closely related to the scrub-birds (Atrichornithidae) and some authorities combine both in a single family, but evidence that they are also related to the bowerbirds remains controversial. Lyrebirds are not endangered in the short to medium term. Albert's Lyrebird has a very restricted habitat but appears to be secure within it so long as the habitat remains intact, while the Superb Lyrebird, once seriously threatened by habitat destruction, is now classified as common. Even so, lyrebirds are vulnerable to cats and foxes, and it remains to be seen if habitat protection schemes will stand up to increased human population pressure. Lyrebirds are ancient Australian animals: The Australian Museum has fossils of lyrebirds dating back to about 15 million years ago . The prehistoric Menura tyawanoides has been described from Early Miocene fossils found at the famous Riversleigh site. The lyrebird has been featured as a symbol and emblem many times, especially in New South Wales and Victoria (where the Superb Lyrebird has its natural habitat) – and in Queensland in Australia (where Albert's Lyrebird has its natural habitat). A stylized Superb Lyrebird appears in the transparent window of the Australian 100 dollar note. The pattern on the curtains of the Victorian State Theatre is the image of a male Superb Lyrebird, in courtship display, as viewed from the front. A stylized illustration of a male Albert's Lyrebird was the logo of the Queensland Conservatorium of Music, before the Conservatorium became part of Griffith University. In the logo, the top part of the lyrebird's tail became a music stave. A stylized illustration of part of a male Superb Lyrebird's tail is the logo for the Lyrebird Arts Council of Victoria. There are many other companies with the name of Lyrebird, and these also have lyrebird logos. 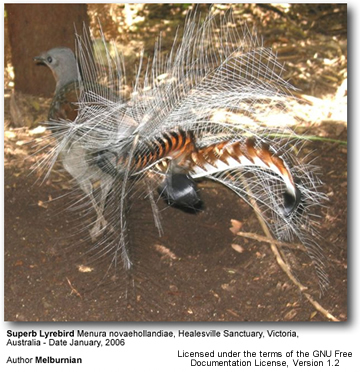 The lyrebird is so called because the male bird has a spectacular tail (consisting of 16 highly modified feathers (two long slender lyrates at the centre of the plume, two broader medians on the outside edges and twelve filamentaries arrayed between them), which was originally thought to resemble a lyre. This happened when a lyrebird specimen (which had been taken from Australia to England during the early 1800's) was prepared for display at the British Museum by a taxidermist who had never seen a live lyrebird. The taxidermist mistakenly thought that the tail would resemble a lyre, and that the tail would be held in a similar way to that of a peacock during courtship display, and so he arranged the feathers in this way. Later, John Gould (who had also never seen a live lyrebird), painted the lyrebird from the British Museum specimen. Although very beautiful, the male lyrebird's tail is not held as in John Gould's painting. Instead, the male lyrebird's tail is fanned over the lyrebird during courtship display, with the tail completely covering his head and back — as can be seen on an Australian 10 cent coin (above), where the Lyrebird's tail (in courtship display) is portrayed accurately.